Trevor Jones always delivers a good time at his shows. 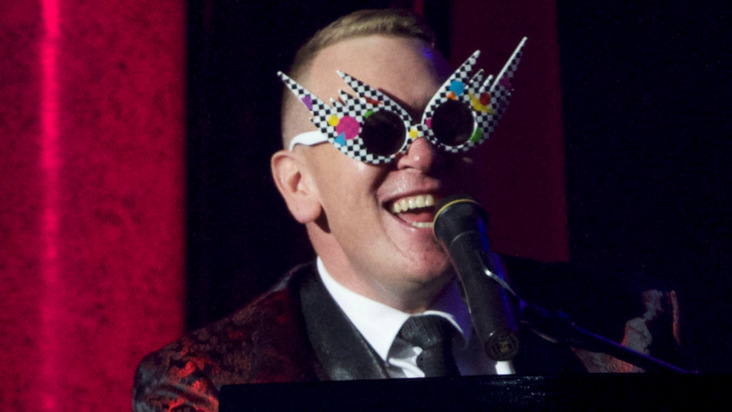 The affable singing piano player has a great knack for developing frivolous banter with an audience and making you feel warmly embraced. Jones, who works across musical theatre, cabaret, opera and a range of musical genres wondered what would happen if he got his schedule mixed up and he accidentally turned up to a rock gig with is opera hat on? This is the central premise of the show, just how far apart are these different worlds? Jones starts the show by discussing the promotional posters for the show, where he recreates Miley Cyrus’ famous Wrecking Ball image wearing nothing but his underwear and Brunhilde’s helmet. Through out the show the Miley Cyrus’ tune repetitively appears, each time it’s given a different treatment, what if it was performed as an opera? What if Elton John or Billy Joel had played it? It turns out that Wagner’s Ring Cycle and Beyonce’s biggest hits actually have a lot in common and The Spice Girls’ tunes could have come from the land of musical theatre. Downstairs at The Maj is the perfect venue for Jones’ show, he’s performed here several times over the years – although this is his first appearance at Fringe World. The intimate, darkly lit, space is perfect for a friendly sing-a-long. Take some friends, order some wine and take in the fun musical mish-mash. Kollision is playsing as part of Fringe World.